Missionaries Josh and Ruthie Wagner share a common heart and love for people, and for seeing God worshiped among the nations. Josh grew up as the oldest of six children in the Minneapolis area, where he and his family were heavily involved with inner-city ministry. As he grew up, he sensed a call toward cross-cultural ministry, particularly overseas. Ruthie is a third-generation missionary and grew up in Bangladesh. She moved to Minneapolis for Bible school, where God called her to love people by giving them His Word in the languages they know best like He had done for her. 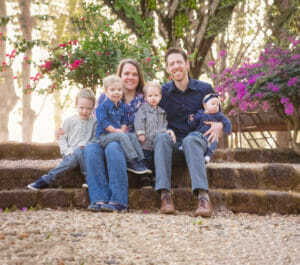 Josh and Ruthie met at a Bible translation meeting and married in 2009. Josh has been working as Scripture Engagement Advisor and Ruthie as Translation Advisor among the Themne people in Sierra Leone since fall 2013. They have four children: Elijah, Isaiah, Josiah and Elizabeth. Please pray that God’s Word would go forth and speak to the hearts of over two million Themne speakers!